Gordon D. Chase is an artist, teacher, and organizer who believes that art can be used to ask important questions. Why are we here? What is our responsibility to each other? What can each of us do to achieve change? Chase grew up in New England, taught for decades at Groton School and Milton Academy, and has created shows titled “Creatures,” “Conflict and Compromise”, and “Human Behavior.” He now works full-time as an artist and volunteers with GBPSR – the Greater Boston Physicians for Social Responsibility – a group working to address the threats of climate change and of nuclear war. The drawings and sculptures in this show explore the psychological space created by the threat of nuclear war. Even with the devastating attacks on Hiroshima and Nagasaki seventy years ago we persist in edging ever closer to the brink of nuclear holocaust. Why do we tempt fate with proposals for trillion dollar upgrades to these weapons of mass destruction? 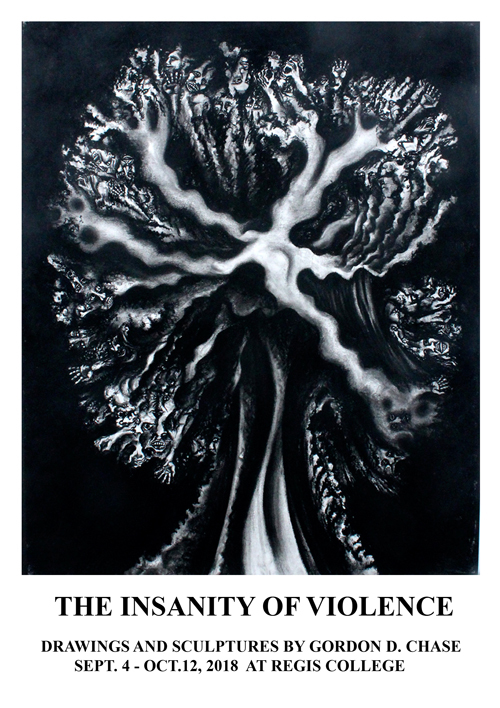 This show explores the role that each of us plays as a witness to violence. It is a show about “bystander mentality.” It asks each of us to become a messenger to help stop our self-destructive behavior. HUBweeks brings together innovators, artists, curious minds, and change makers to explore the ways in which we can shape a more inclusive and equitable for all. A free event, but registration is required. Nuclear Weapons: Can We Get Rid of Them Before They Get Rid of Us? EVENT DESCRIPTION: We have never been closer to a world without nuclear weapons. The United Nations last year passed a treaty to ban all nuclear weapons, similar to resolutions prohibiting chemical and biological weapons. At the same time, we have rarely been closer to blundering into the use of these same weapons. 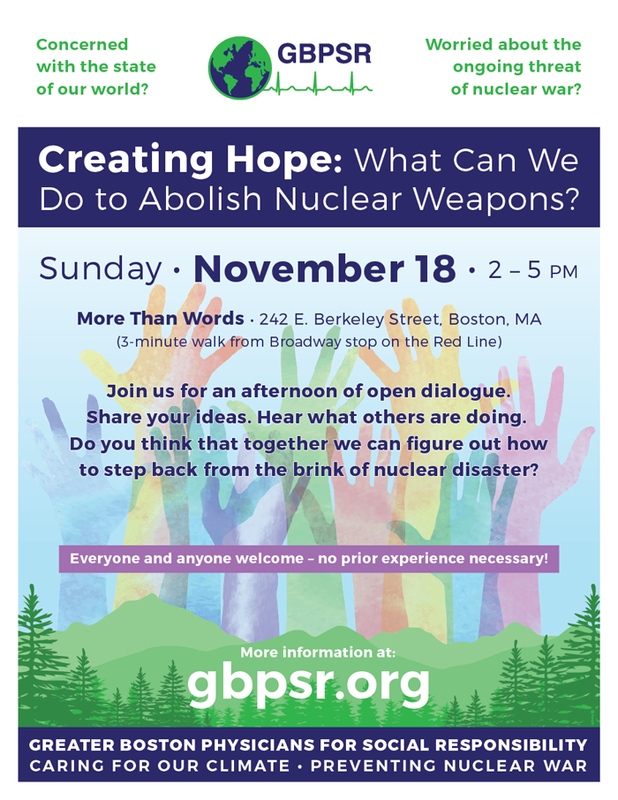 Join the Greater Boston Physicians for Social Responsibility (GBPSR) for a dynamic presentation about this extremely hopeful yet extremely dangerous moment. Learn about the dangers, the solutions, and how you can get involved. The GBPSR is a local chapter of the Physicians for Social Responsibility (PSR®), a national organization of over 50,000 physicians, health care professionals, and supporters known as “the active conscience of the medical community” first formed in 1961 to address the health consequences of nuclear and other weapons of mass destruction. GBPSR and IPPNW are honored to have been selected as Community Partners for the 2018 season of the Longwood Symphony Orchestra’s (LSO’s) Healing Art of Music™ program. As Community Partners, we will be featured during an evening LSO concert on Saturday, October 13th, at New England Conservatory’s Jordan Hall in Boston, with proceeds benefiting our organizations’ efforts to prevent nuclear war. The concert, as well as a dinner beforehand, will be dedicated to the memory of Dr. Victor Sidel, who was a pioneer and leader of our two organizations. 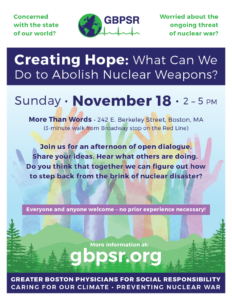 On Friday, October 26, 2018, from 4:00 – 6:00 pm, the International Physicians for Prevention of Nuclear War (IPPNW) and Greater Boston Physicians for Social Responsibility (GBPSR), founded by Harvard affiliated and other Boston area medical professionals, are featured at an event celebrating the two Nobel Peace Prizes received by IPPNW in 1985 and in 2017, as the founding partner of the International Campaign to Abolish Nuclear Weapons (ICAN). The reception and program will be sponsored by the Countway Library of Medicine, at Harvard Medical School highlights the Nobel Peace Prizes, and follows the Harvard Medical School’s October 4 symposium on “The History, Uses, and Future of the Nobel Prize.” The October 26 event also opens an exhibit of original poster art by Corita Kent that was presented to GBPSR in the 1980s in recognition of its work for a world without war. The event will be open to Boston’s medical community and the public, will feature some of the founders and current, active board members of IPPNW and GBPSR. To acknowledge a new generation in the continuing international effort to abolish nuclear weapons, young physicians and medical students from Central America, Africa, Europe, and the U.S. will address the recently approved United Nations Treaty for the Prohibition of Nuclear Weapons and renewed efforts in the US to reduce and eliminate the danger of nuclear war through the “Back from the Brink” campaign. 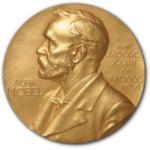 Official replica medals of the 1985 and 2017 Nobel Peace Prizes will be on display at the Library event, and refreshments will be served. International music will be performed by musicians from around the world, as well as chamber music from members of the Longwood Symphony Orchestra, which is partnering with IPPNW and GBPSR this fall. All guests are invited to learn more about this important work at this critical time in world history. Keynote speaker: Tilman Ruff, Australia, co-president of IPPNW and founding chair of International Campaign to Abolish Nuclear Weapons, with a panel of local speakers: David Wright of UCS, Jonathan King of Mass Peace Action, Aron Bernstein of Nuclear Weapons Education Project, Kea van der Ziel of GBPSR. Worried about the ongoing threat of nuclear war? Join us for an afternoon of open dialogue and brainstorming. We have a particularly creative and engaging agenda for the day. Martin Fleck, Nuclear Weapons Abolition Program from National PSR and Lilly Adams, Security Program Organizer from Washington PSR, will be joining us. RSVP to abaker@gbpsr.org helpful but not mandatory. Everyone and anyone welcome — no prior experience necessary!